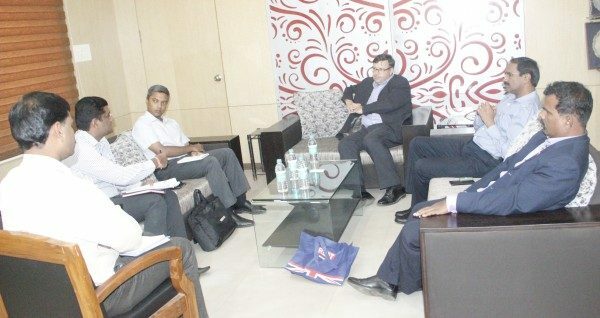 Dominic McAllister, British Deputy High Commissioner Bengaluru today visited Belagvi and met DC N Jayram and City Corporation Commissioner G Prabhu and expressed that the British Govt is keen on helping and investing Belagavi city with the implementation of the Smart city proposal prepared by it. Mr. McAllister also keenly saw the presentation on the Smart city proposal and also discussed at length about it with the officials. The British Government is keen on helping India with its Smart city plan and it implementation and for the same it has selected Belagavi, Mr. McAllister said. Mr.McAllister will now submit a report about the same and a detailed plan on how the British Govt can help the implementation of SCP will be finalized.